How are Capital Gains Handled in the Sale of a Business? Capital gains are a different type of income from ordinary income on business profits. Taxes on capital gains taxes come into play when a capital asset is sold. Capital assets are typically part of the sale of a business. Capital gains tax is a tax charged on all capital gains, which are profits on sales of specific types of business assets and on capital shares of corporations by shareholders. If you have an asset, the capital gains tax only applies when you sell the asset for a profit or loss. Capital gains are taxed differently, depending on how long they are held. Short-term capital gains (held under one year) are taxed at the regular income tax rate. The tax rate for long-term gains is 17 percent (effective in 2018). Capital Assets are all types of property that are held by a company for investment and useful business purposes. Capital assets are those assets used by the business to make a profit. Some types of business property that are not included in the definition of capital assets are raw materials and personal property. Some business sales involve only the sale of specific business assets. In these circumstances, there may be no customers or property (land and building) to be sold. In this case, if you sell business assets (equipment, furniture and fixtures, company-owned vehicles), the gain on the sale of these assets is considered an ordinary gain. That is, the gain is considered as ordinary income to the business, as opposed to a capital gain. Ordinary gains are reported to the IRS in your business tax return, on Form 4797. Even though the assets are sold as a "package," there must be a determination of capital gain or loss on each asset. The IRS says, "The sale of a trade or business for a lump sum is considered a sale of each individual asset rather than of a single asset." The IRS treats different kinds of assets in a business sale differently for tax purposes. Some assets are considered capital assets and subject to capital gains, while other assets are considered depreciable property or real property (land and buildings). For more information on this subject, see this IRS article on handling assets in a business sale. A corporation is owned by the shareholders. When a corporation is sold, the shares of the corporation are valued. 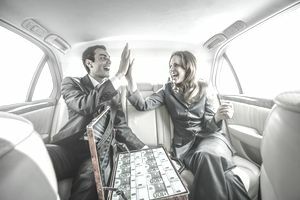 ​The difference in value is considered a capital gain or loss, reportable on the shareholder's personal tax return on Schedule D.
The partnership share of a partner is considered a capital asset and results in a capital gain (or loss) when sold. The shares of a shareholder are capital gains or losses when sold, either as part of a business sale or when a shareholder wishes to be cashed out. The part of any gain or loss from unrealized receivables (those not yet collected) or inventory items are treated as ordinary gain or loss (not capital gain/loss). See IRS Publication 544 for more information on the tax implications on the sale of business assets. Disclaimer: The tax treatment of capital gains is complicated, and the information in this article and on this site is intended to be general and should not be considered as tax or legal advice. Each business is unique, and taxes and regulations change frequently. Consult your tax professional before preparing your business tax return.